Splayed cladding, otherwise known as rainscreen cladding consists of rhomboid shaped boards equally spaced apart to form a decorative façade. 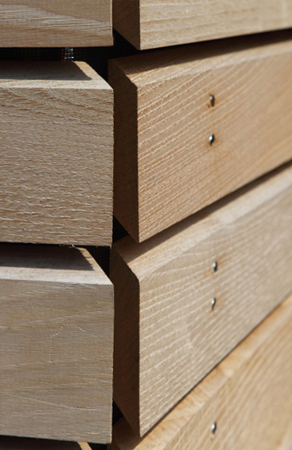 Unlike most other types of cladding, splayed boards are not interlocked or connected which means that the resulting cladding is not waterproof. 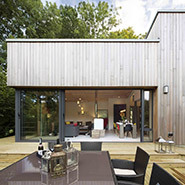 For this reason splayed cladding must only be used in front of a fully waterproof surface. The splayed profile creates a clean linear appearance which is ideal for renovating old walls or contemporary new-builds. Splayed cladding is most commonly fixed horizontally. For more protection from the elements with a similar appearance consider using our halflap profile VHL7. All air-dried species can be machined to splayed. 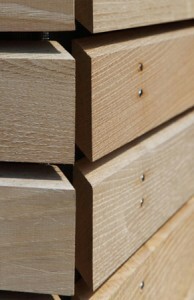 The most popular choices are British sweet chestnut and British oak. Length Random lengths from 2.0 – 4.0 metres, depending on specieSpecial or bespoke profiles up to 200mm wide can be provided. 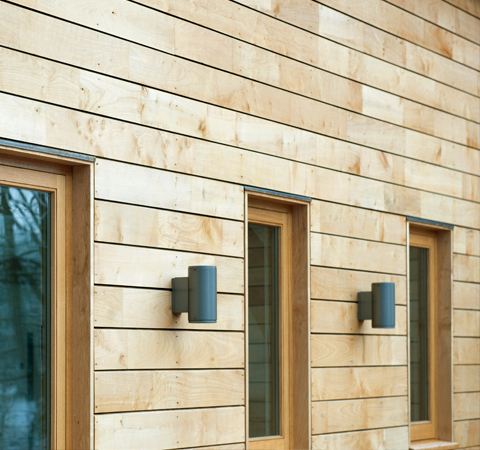 However, for external cladding, it is generally recommended that boards do not exceed 150mm in width. When to fix Year round. Ideally September to March. Begin at the bottom, ensuring that the first board is level. Orientate the board so that the uppermost edge is sloping down and away from the building. For boards up to 150mm wide, use two fixings located centrally and spaced approximately 65 – 75mm apart. For boards wider than 150mm, the spacing may have to be increased to 75 – 100mm to prevent the board from cupping.Subsequent boards can be spaced 5 – 10mm apart, depending on the desired appearance. It is important to ensure that any building paper or insulation will not be visible through the gap at eye level.